Sometimes, when an iris hybridizer dies, too quickly his or her irises drop out of commerce and the last introductions often fail to get awards. Paul Cook did win the Dykes the year after his death, and Monty Byers is a huge exception—three posthumous Dykes Medals. There are others, however, who are not as well remembered, so I would like to tell you about two Region 14 hybridizers who I miss. This post is on Joe Gatty. 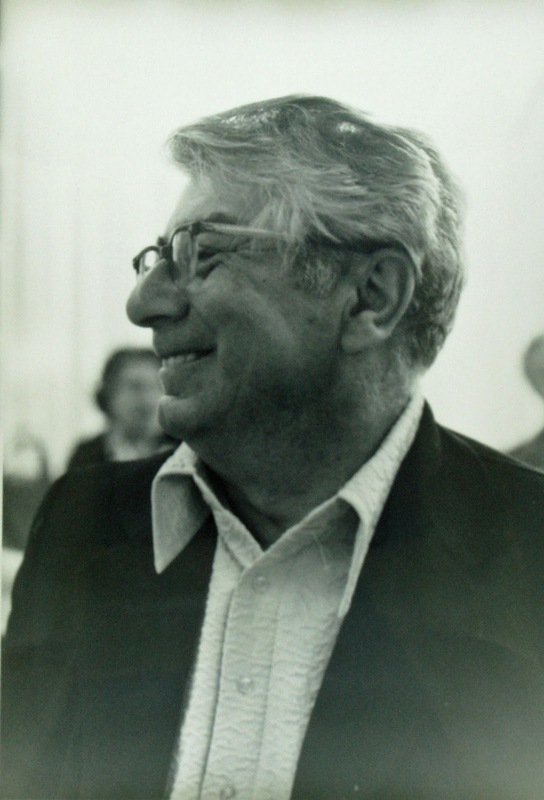 Joe Gatty was a New Jersey transplant to Northern California. 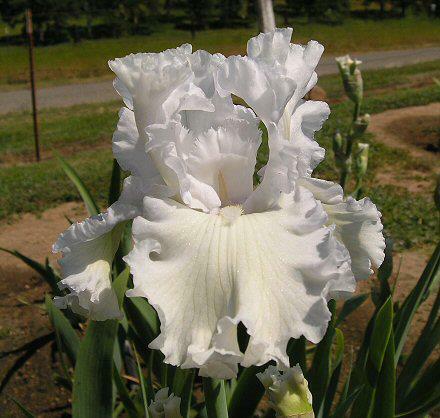 He first had success as a hybridizer when his white tall bearded iris 'Friendship' won the President's Cup. Until his death, Joe produced lovely things from what was really a small seedling patch. Mary Dunn remarked that Gatty irises can be viewed in black and white because they are studies in form. 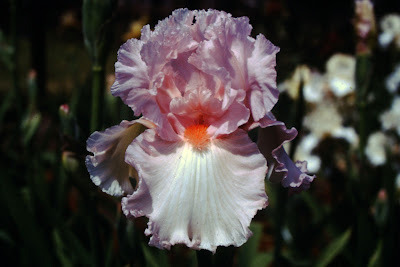 Joe was also an accomplished breeder of median irises. 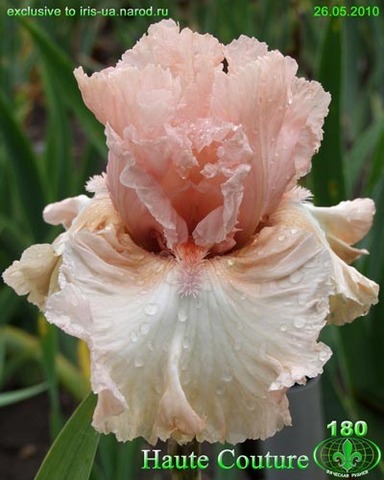 While I am focusing on his tall bearded iris, I must mention that the famous 'Gingerbread Man' has a Gatty seedling as one parent; and 'Rare Edition', an IB plicata, still looks good and sells well today. The story of Joe's medians, however, must wait for another day. Just before moving to California in 1969, Joe explained to me how he had made many out crosses (crosses between two named varieties from other hybridizers) wanting to get some new blood into his hybrids. Keith Keppel explains that "Liz Aulicky had offered use of her land to grow seedlings, so seedlings from his 1967 New Jersey crosses were planted at Liz's in 1968. His 1968 seeds were sent to me and were planted in California, lined out in 1969. When he arrived in California in 1969, that year's crosses were made on what I was growing....it was with great trepidation that he used such 'tender California stuff' as 'Launching Pad' and 'New Moon', because he figured the seedlings would not be hardy back east. We had to twist his arm to get him to put 'White Lightning' on the market. Also in 1969, Liz sent what she had selected from the seedlings blooming from his 1967 seed crop. 'Princess', 'Liz', 'Shining Light', 'Vamp' and 'Hooray' were amongst her selections." Here are a few examples of his wonderful pinks through the years. Every time that I see a lovely pink iris, I always judge them against the Gatty pink standard. Near the end of his life, Joe released 'Haute Couture', and with its pleated ruffling, it suggested a different direction in form. To date, it is the only variety that I know with this distinctive deep pleating way down into the falls. Joe's first California native Tall Bearded iris was 'White Lightning' and quickly he took the line forward with increasingly lovely creations. Some of the 'White Lightning' children are pictured below. Along the line Joe had some good golds, though they did not seem to attract as much attention as his other colors. Joe was also generous. He would share pollen and plants, and two of my introductions had a Gatty seedling a parent. Despite his years in California, Joe never lost his charming New Jersey accent, and he maintained his eye for lovely form. 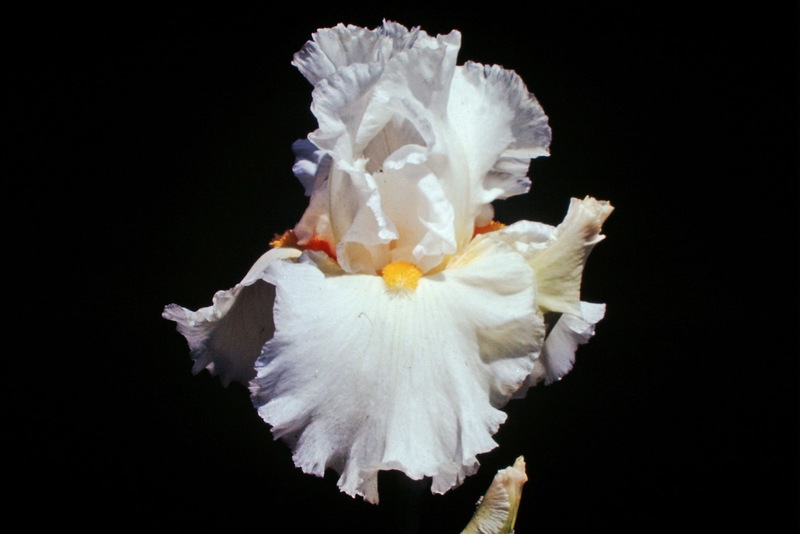 One of Joe's great successes was the white 'Friendship', and one of his loveliest irises still in commerce today is the deeply ruffled white, 'Arctic Express'. Who needs color with form like this? Although I still grow many of Joe Gatty's irises of lovely form, I failed to get his delicious recipe for cheesecake, which I regret to this day. Editor's Note: Do you grow any of Gatty's lovely irises? How about you East Coasters? Great article Bryce. Love iris history and all the great examples of Gatty's great work, which otherwise would be lost in the archives. Thank you. Many years ago, I was gifted a lovely white iris I was told was an award-winner named "Friendship". Out of curiosity sparked by a friend's recent inquiry about the flower, I stumbled upon this article, hoping to find a photo to verify the identity of my iris, as the "Friendship" iris has not turned up in any other internet searches. If anyone has a photo of a known "Friendship" iris, I would be eternally grateful for the sharing of it. I do not know that iris, so I don't know how good the picture is of the flower. Friendship was created before Joe moved to California.